Dealing with infertility is stressful. Studies show that individuals struggling with infertility are likely to suffer from symptoms of depression and anxiety. Many individuals experiencing infertility rank it as the most upsetting and stressful event in their lives thus far. In addition, individuals and couples undergoing infertility treatment must make many difficult decisions, such as selecting the best doctor and clinic, and choosing the next level of type of treatment. If treatment is not successful, increasingly complex decisions must be faced about the use of third party reproduction, adoption, or a living a child-free lifestyle. Finding a therapist who understands both the medical and emotional demands of infertility is vital to treatment success. 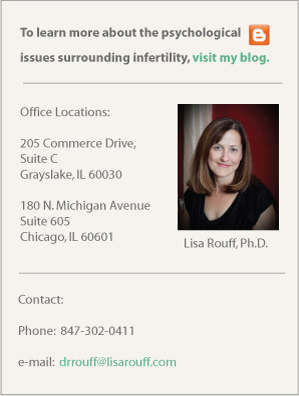 In addition to her clinical expertise helping clients to cope with infertility, Dr. Rouff has had personal experience with infertility and adoption. She is also a member of the American Society of Reproductive Medicine and a professional member of Resolve, an infertility support organization.